Sorry for this week's delayed post.My younger sister Radha was here for the past week.We had a great time together after years by spending most of the time in chatting,shopping etc .So i gave a small break to my blog posts .Today’s Sunday biryani recipe is Hyderabad’s most popular qabooli biryani made using chana dal.I made this for my sister and she loved it a lot.When I heard about the title of this biryani,I wondered how come a biryani can be made just by using chana dal.But when I prepared it,I was really amazed with the flavor and taste.For any biryani,it’s the whole garam masala and spice powders that matters the taste.Even if u add vegetables,meat or make plain biryani,the right amount of spices is the key.For this biryani,Curd chutney is the best side dish that is served in Hyderabad,Andhra.So I made perugu pachadi/Curd chutney(Dahi chutney) by referring Preeti’s blog.For this biryani recipe,I watched Vahchef’s video and referred preeti’s recipe too.Friends,do try this kabuli chana biryani with curd chutney for your Sunday Lunch.Relish it with your family. Wash and soak the basmati rice and chana dal for 30 minutes. Slice the big onion and deep fry till it turns golden brown.Set aside. Boil 6 cups of water and some salt.Add the whole garam masala.Drain the excess water from the soaked rice.When the water comes to roll boil,add the rice and boil for 5-7 minutes in medium flame.Remove the rice when it is cooked till 90%.Let it cool.Do not drain the boiled water. In the same water,add the soaked chana dal and cook till its firm and soft.Drain the excess water and keep the cooked chana aside. Heat oil+ghee in a kadai and saute the whole garam masala.Now add the sliced onions,g&g paste and green chilli.Saute till onion turns transparent.Add mint leaves and mix well. Add the spice powders and salt one by one and mix well.Lastly add the curd and mix well.Add the cooked chana dal and give a nice boil till the gravy thickens a bit. Make sure there is little water and the gravy is not too dry. Once the gravy is done,layer the cooked rice and sprinkle some chopped mint leaves. 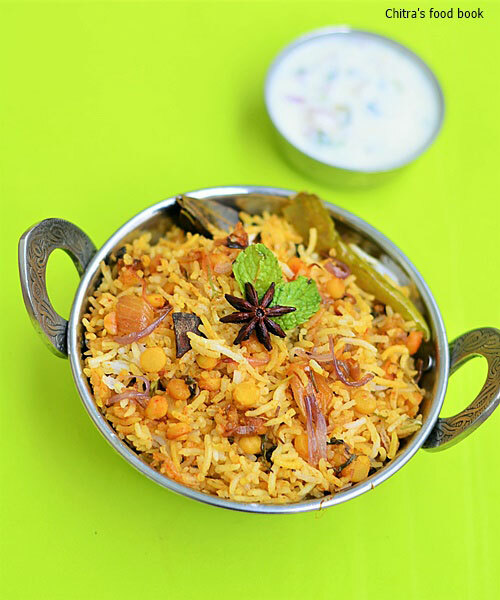 Garnish with caramalized onions and add some lemon juice.Cover the kadai tightly with a lid and keep the flame low.Put in DUM for 15 minutes.Nice aroma will waft through.It shows your biryani is done.Remove and fluff it with a fork.Serve with curd chutney or mirchi ka salan.These two are meant to be the best side dish for this biryani. Finely chop the green chilli,mint leaves,coriander leaves and onions.Take them in a bowl.Mix thick curd and salt.Beat well and serve. I saw some kabuli biryani using black chana. If you are using that,soak the chana overnight and then cook them in pressure cooker till done. Increase the quantity of green chilli for more spicy biryani. 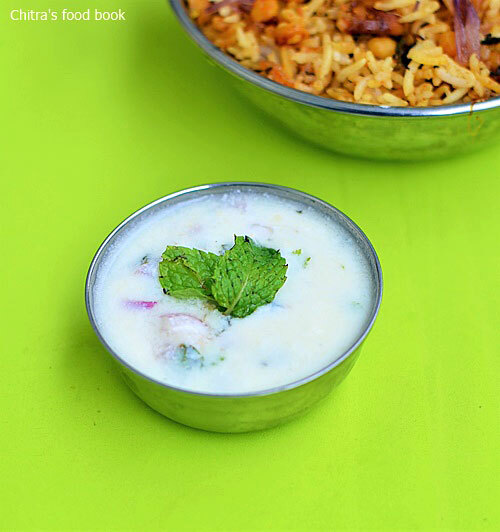 Enjoy kabuli biryani with this simple curd chutney.It’s the best side dish ! Yummy one pot meal.. looks so inviting. 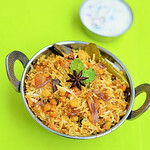 Its tempting, so much types of briyani I am veiw in ur blog. I have tried veiw its came out well. Thank u Sankar Saranya :) I am glad to see your feedback. 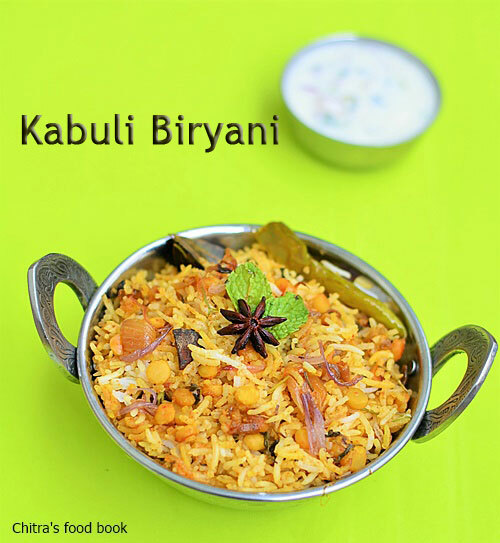 Heard about this biryani ,but never did.Thats a wonderful biyani indeed.